GBF was founded in 1964 by Dan Bowman as Guilford Business Forms, which served local businesses' forms needs. 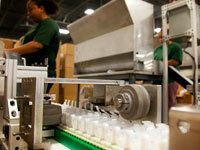 By the 1980’s GBF, Inc. expanded into chain of custody forms to serve the growing laboratories market. Through hands-on work with these customers, GBF began to supply more components used in urine drug testing, such as bags, evidence tape, cups and bottles. When the Federal government mandated a drug-free workplace in the mid-1980’s, the demand for drugs of abuse testing grew dramatically. During this time, GBF created a medical packaging group to better serve our existing customers and meet the need for drug collection kits in the laboratory market. We have continued to expand and adapt to the changing landscape of the packaging and printing markets by expanding our product offerings and capability, offering supply chain management and distribution solutions to our customers. Our longevity and history provide our customers with decades of knowledge and experience. We realize that consistent and future value creation is equally important. To meet these market demands GBF has invested in automated manufacturing equipment and leveraged in-house IT to streamline our distribution and supply chains. While we began as a forms distributor, we have continued to evolve into a full-service custom kit manufacturer and supply chain partner dedicated to the laboratory and life science market. Copyright © 2012 GBF, Inc. All rights reserved.